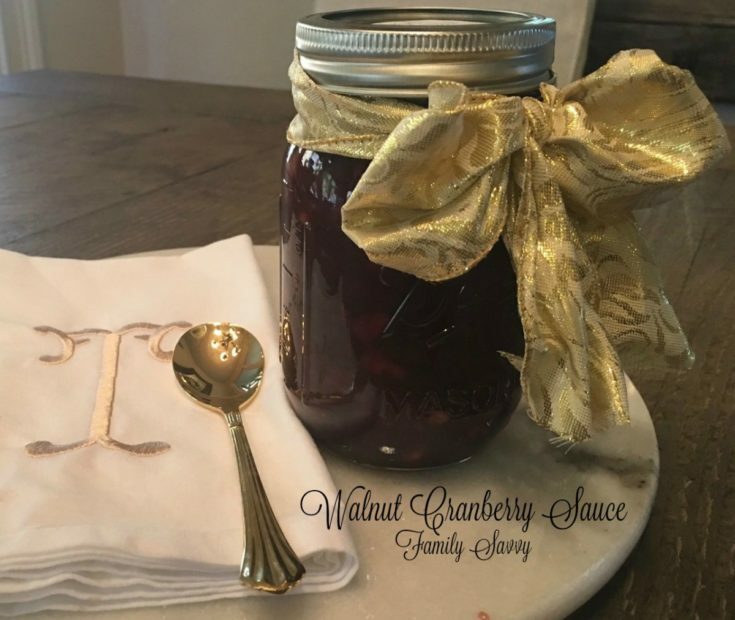 Hands down the best cranberry sauce you’ll ever eat, this easy to make walnut cranberry sauce is sweet, tart & tangy~with a slight kick from balsamic or pinot. This is a MUST serve side for turkey & dressing!!! 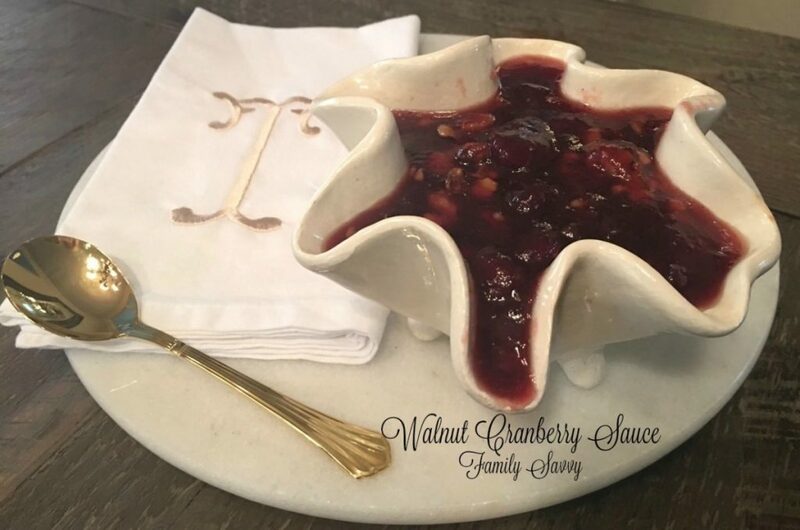 This walnut cranberry sauce is a Southern Living recipe from 2000, and it is an absolute winner of a recipe. I first tried it at a cooking club that I was in BC (before children). My friend Leigh Ann made a yummy pork tenderloin and served this alongside. It is AWESOME!! This couldn’t be easier. It takes less than 10 minutes to make. It tastes great warm or chilled, and several batches can be made ahead and kept in the fridge to give as hostess gifts or holiday treats for teachers & neighbors. I plan to take a jar to all the hostesses whose homes I dine in during the holiday season. You’ll never ever ever go back to plain canned cranberry sauce again. I promise. This sauce is sweet, tangy & tart~with a slight kick from the balsamic (or Pinot). Note: If you use balsamic, use good quality. If you don’t have a good balsamic, I suggest buying a small bottle of pinot noir at The Fresh Market and using it to make several jars of this sauce. If you make this, please let me hear how you like it. Your turkey and dressing will go over the top with this on the side~promise!! As always, thanks so much for stopping by. Be blessed, and stay savvy!!! Cook over medium heat, stirring often, just until thoroughly heated. Remove from heat; stir in walnuts and vinegar. Cover and chill until ready to serve. Serve with turkey, pork tenderloin, or ham. Your Walnut Cranberry Sauce is now a Yeager family holiday staple. It gives such a beautiful pop of color to the plate and is a delicious accompaniment to turkey or ham. Thank you so much for sharing this winner!